If you are not finding what you need after using the basic search box above, try the advanced search tips below. As you can see from the example above, you can also add rows to our search. Using this example, if you had an ISBN number for a specific copy you want, you could add a row, select ISBN from third dropdown menu and enter the ISBN number. Note, that when searching this way, the system automatically uses the "AND" boolean operator which makes sure both of your search terms appear in the results list. If you want, you can change this boolean operator to OR or NOT. Finally on the advanced search screen is the option to search specific databases. 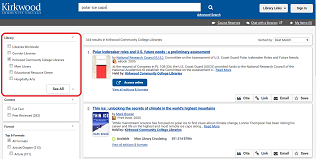 By default, the catalog searches our holdings and most of are electronic content automatically, however, by selecting specific databases, you can perform a search for content within the selected databases. This can be useful if you are searching for highly specified content within a single discipline. This can be useful if you want to search multiple databases on the same subject at once rather than opening and searching within each database individually. Before using this database searching feature, we strongly recommend trying the standard catalog search first. You can use all of the search limiters mentioned above by selecting options from the left-hand side of the screen after conducting a search. So, if you use the standard search box and are not seeing what you need try using the limiters to see if you can narrow down your results. Note that if you click the box labeled, "Keep selections for next search," the system will remember the limiters you selected so you can reuse them for subsequent searching.